Fabulous McGrady and Friends Foundation’s (FMFF) relationship with Montgomery County began with our first trip to Montgomery County Animal Control (MCAC) back in November 2013 (story). Over the past 18 months, the Positive Change train has kept a-rollin’. The new Montgomery County Humane Society (MCHS) facility will have its Grand Opening May 16, 2015, right next door to MCAC. On April 25, 2015, FMFF was pleased to make a supply delivery to MCHS to help them stock up their supply room in anticipation of their opening. The history of Montgomery County Humane Society goes back to 1998 when Mrs. Sally Morris and her husband, a veteran wounded in the Bosnian War, along with a few other like-minded citizens, saw the need for an organization to help the animals in Montgomery County. In a story heard not infrequently, the opportunity to help the animals in need proved very helpful for Mr. Morris in his recovery from his injuries. The small group started off with 18 kennel runs in the Morris Family backyard. In time, MCHS was able to apply for and achieve 501c3 status. MCHS began its existence with a total of 18 kennel runs in the Morris Family backyard. As MCHS was a bit of a grassroots effort funded mostly by the founders and a few like-minded people, most of the money went to pay Veterinary bills for animals in need (which we all know can mount up fast). The severe storms that have hit the area over the past few years and general wear-and-tear from outdoor elements took out 9 kennel runs over time, leaving a grand total of 7 kennel runs in the Morris Family backyard at the present time. In other words, the new facility with its 25 kennel runs and 16 cat cages could NOT have come at a better time! 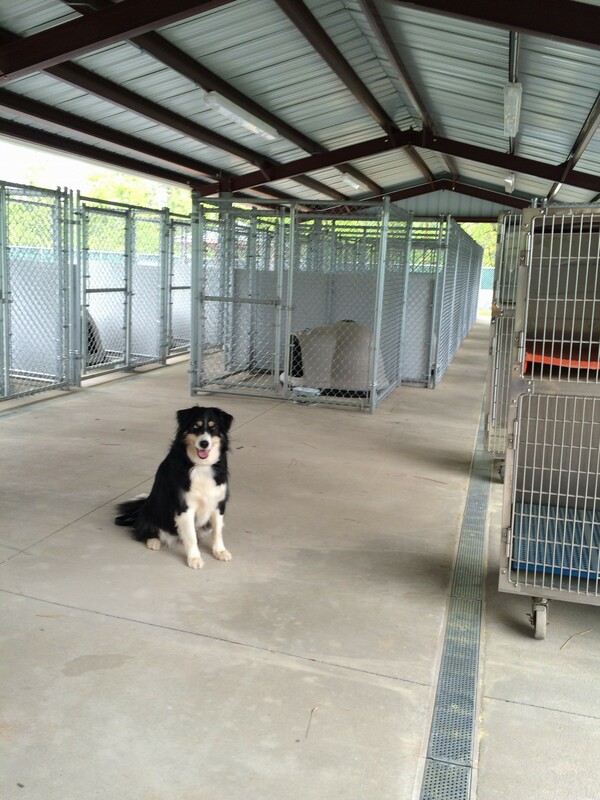 McGrady in front of the kennel runs and cat cages that are being prepared to receive their furry guests! The facility is planning its Grand Opening on May 16, 2015 from 3-5PM. 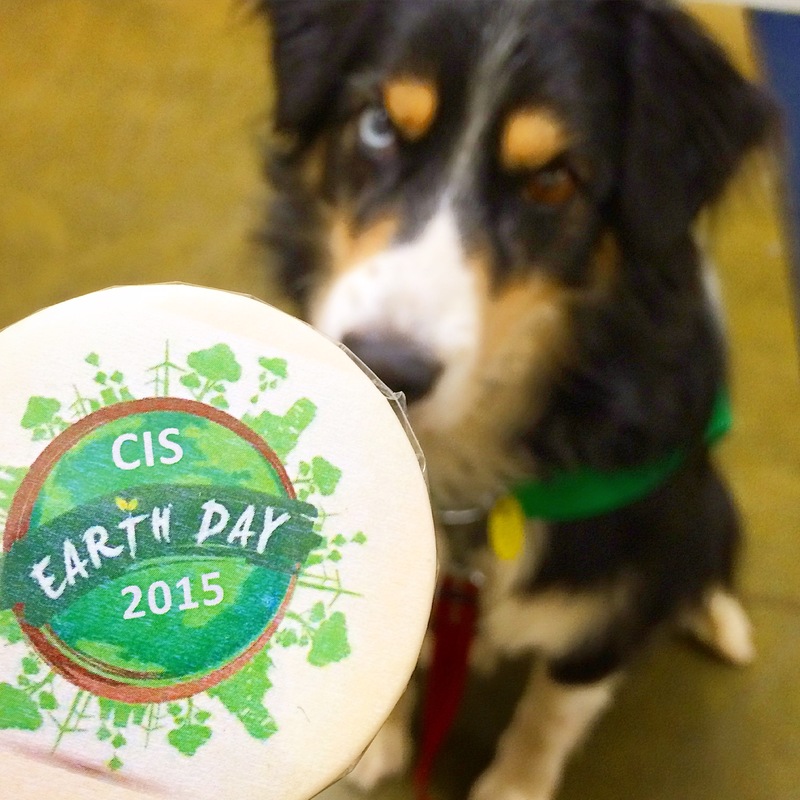 There are several benefits planned in the area to raise funds for care of future animals. MCHS has used a LARGE part of its money building the new facility, purchasing kennel runs/cat cages and (most recently) purchasing brand new Igloo dog houses for each kennel run…..they still have lots of other purchases to make, not to mention daily operating expenses now that they have the largest capacity to help animals that they’ve ever had! McGrady in front of the MCHS Supply Room stocked with the supplies we just delivered. Note there are TWO long shelves to McGrady’s left just waiting for what YOU would like to send. McGrady stopping by Barks Bones & Biscuits Bakery to talk with owner, Robyn, and empty the full donation barrel!!! 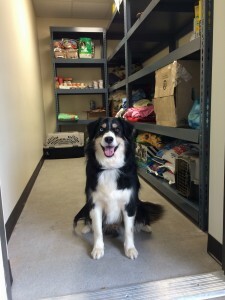 Fabulous McGrady and Friends Foundation is thrilled to be able to recycle gently-used goods that are much-needed by rural animal shelters and humane societies such as MCHS. We could NOT have helped stock MCHS up on supplies without the support of the Greater Charlotte community! 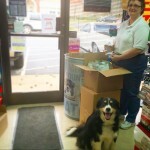 Our friends at Barks, Bones and Biscuits Bakery host a donation barrel for us that is available to receive donations during their business hours. They donated bags of dog and cat food from their inventory to us and also got their local community involved by offering cans of dog food available for purchase to donate to us for $1/can! Fullwood Animal Hospital had a donation drive at Christmas time 2013 that resulted in the donation of multiple blankets/towels, collars/leashes and food bowls. Much of that had gone other places but a lot went with us to MCHS. Fabulous McGrady and Friends Foundation will hold on to every donation until we find just the right spot for it as we tailor our deliveries to each shelter’s specific needs! Thoughtful Charlotte resident, Dawn, contacted us upon the death of her beloved dog, Hanna. She donated Hanna’s beds, food bowls, toys, outfits and other items. We emailed Dawn to let her know that most of Hanna’s things were going with us to help other pups out at MCHS. We have also had the support of many other friends and private individuals who’ve donated towels, beds, bowls, etc. 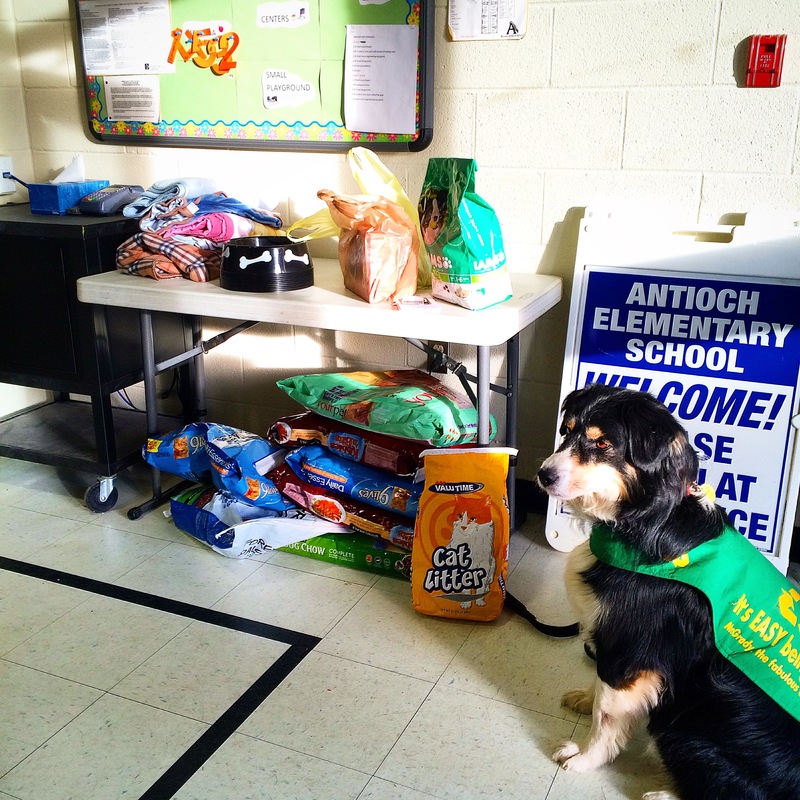 Goods collected by the wonderful folks at Antioch Elementary School for us to take to MCHS! 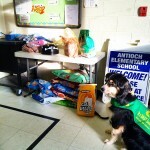 McGrady is also happy to come to area elementary schools and educate them on recycling for animals shelters, the fabulosity of deaf dogs and/or share child/pet safety tips. He visited 2 schools, Carolina International School & Antioch Church Elementary School, both of whom held donation drives for Fabulous McGrady and Friends Foundation. 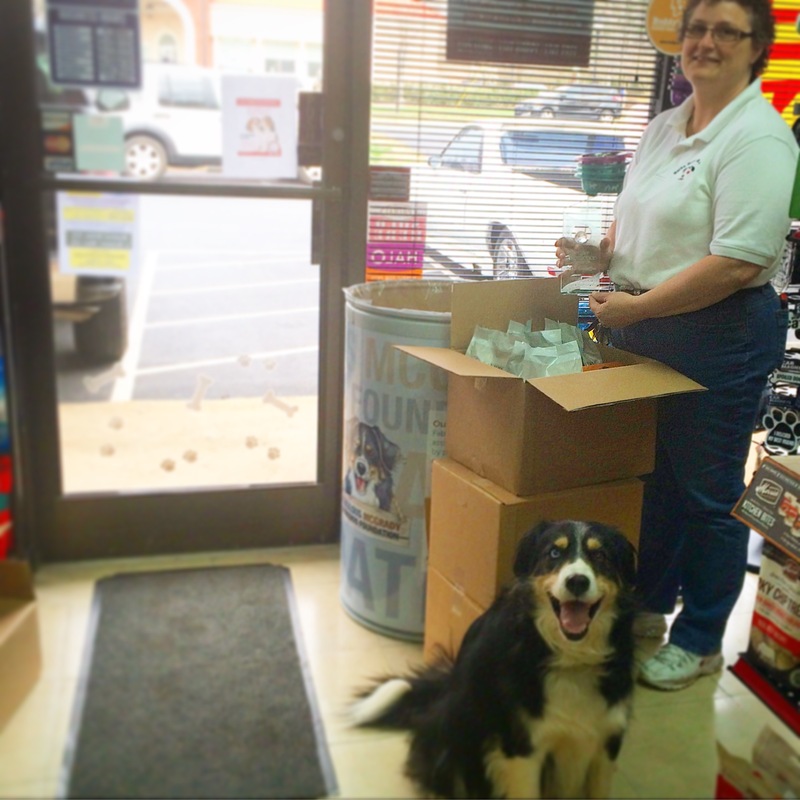 At both drives we received donations of pet food, bowls and cat litter earmarked specifically for MCHS. FMFF was also invited back for a second time to the Union County (NC) Earth Day celebration. 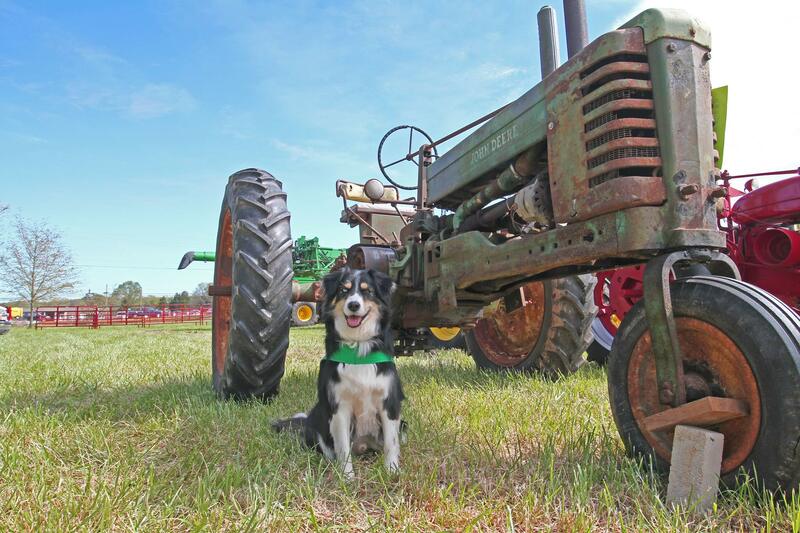 This year, the event was rolled in with the annual Antique Tractor and Farm Equipment Show and called the “Union County Heritage Festival”. Our table highlighted how people can help their local shelter and the Earth through recycling gently used pet-related goods for reuse at their or other animal shelters. We also had a little time to tour the antique tractor exhibition and talk to other exhibitors. The festival organizers allowed us to have a donation barrel at the entrance of the show and we received several donations of pet food which went with us to MCHS. So what was in the truck? 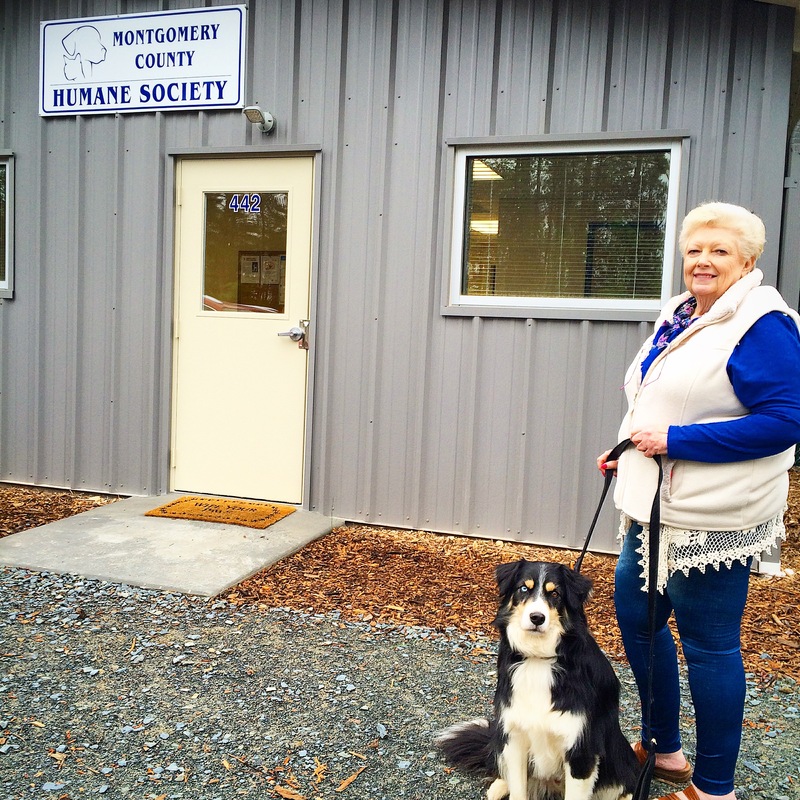 During our visit to Montgomery County Humane Society, we were also able to meet up with our old friend, Teresa, who is one of the women behind the Montgomery County Spay/Neuter Van Program, which helps get animals to the discounted spay/neuter clinic in neighboring Moore County. (See our post from 2014 about this fantastic program here). The Clinic is an awesome resource for those in the surrounding counties. However, their hours are the same as those that the people who need it most are usually at work. These pet owners usually do not have a lot of flexibility in their schedule/cannot afford to miss any work to drive the 45-minute one-way drive there and back—not to mention to wait on the surgery to be done. These ladies rotate their meeting spots around the 400-plus mile county and pick up animals at 6 AM to take them to the Clinic and deliver them back to their owners around 6 PM…allowing them to take care of the spay/neuter but also not miss any work….a FABULOUS service that enables many animals to get “fixed” who otherwise wouldn’t. These ladies have also been known to chip in money from their own pockets to help someone who really wanted to have their animals spayed/neutered but who didn’t have all the money needed. The Van Program uses donated crates to transport the animals to/from the Clinic and were in need of some larger crates. Thus, we were more than happy to take a Large and an XL crate out to them! We are also working on an exciting project that will involve several groups in Montgomery County and will look forward to announcing this in the VERY near future….stay tuned!!! 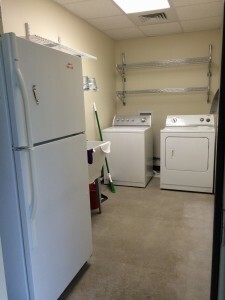 Donate: MCHS has used much of their monetary resources in the building of and buying new equipment for the new facility. 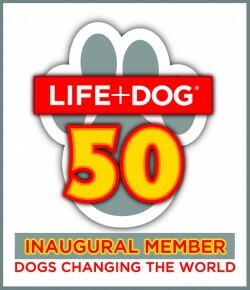 Their expenses will only INCREASE as they help a higher volume of animals than they’ve ever been able to help before. You can have food shipped without paying shipping costs via many outlets like Wal-Mart and, at times, Amazon and the like. Attend: their Grand Opening, May 16, 2015 from 3-5 PM. (see address below) and learn more about their needs for yourself and meet the wonderful volunteers. They are currently working on their phones so check their Facebook page for phone contact information and operating hours! Please keep watch on our Facebook page as we are in the process of putting together a cool project that will involve SEVERAL organizations and Montgomery County residents and that will add to the continuing efforts to make things better for the animals of Montgomery County NC!! !